Jordan Brand will continue the Nike Air Retro 1 Team series by soon releasing a Atlanta Hawks inspired colorway. The first few colorways of the Team series did fairly well not as well as the OG colors of course but we expected that. The Hawks Retro 1 High brings The 4 color combination that is seen through the Hawks logo. The best part about the shoe is the Highlight reels that are said to be Dominique Wilkins highlight reels. The Retro 1 High Hawks will release on September 7th. If you are a fan or just love the color make sure you got your raffle tickets in hand. Check out these detail images and let us know if your copping. Of course by now we know that Wade left Jordan Brand last year to venture into the International Sneaker market. No one would ever think to leave Jordan Brand right? But wade did. And money Talks Despite Being gone for a year already and his sneaker line releasing in China there has still not been a US release or Word of a US release....Until now, the Popular Jordan Brand Sneaker Boutique Solefly, was the first to Drop a Li Ning release in the US not just any Li ning but the limited Gold rush model that we wore on the Heats route to a Championship. The release took place last night and each pair was raffled off. With most of Miami in attendance there was only 100 pairs made and about 80 raffled. Take a closer look at the Li Ning WoW Encore Goldrush. The fear pack as been the buzz over the last few weeks and with slot of confusion about what and when they are dropping. Well its confirmed that all 3 shoes from the Fear Pack will be dropping on the 24th. The Retro 4 will release for $175 while the 3s and 5s will retail for $160. The 5s will be the most limited Pair out of the pack and will only release at very few JB stores. The 4s will be the only pair releasing to GS customers. The tongue for the Fear 5's has been on alot of conversation boards as well. The reason for you seeing a green tongue and a black tongue is when taken with a flash camera the Tongue on the Fear 5 shows 3M Green. The tongue is in fact a very very dark olive color. The material used on the 5's is something that has never been seen before. Take a look at these up close pics to get a idea exactly what materials have been used. The Jordan Retro 5 Line up continues and Jordan Brand is looking to pay homage to the 90's by releasing the Bel Air Retro 5's. 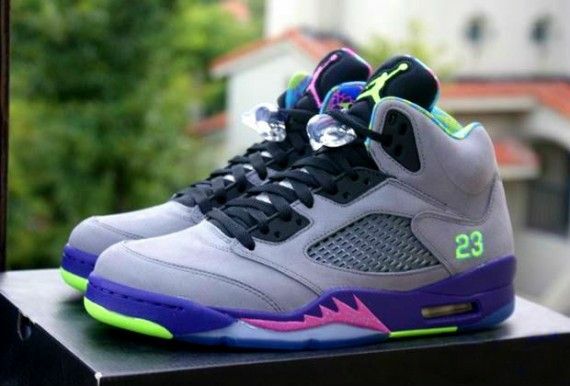 These 5's were made because of the Hit 90's TV sitcom "The Fresh Prince of Bel Air" the actor Will Smith was known throughout the sitcoms years to rock various OG Jordans and Retro's. The Model that Will more post was the Retro 5 when the Sitcom first starting becoming a Hit. The Bel Air 5's takes its color scheme from the Logo of the shoe and the classic 9-'s Aztec print that was popular then. Take a look at these beauties in HD detail and Let us know if this is a for sure cop for you. Of course this is the year of the Retro 5 and of course Jordan Brand will be breaking out all the seen and never before seen. Part of the seen and long await in the Retro 5 lineup this year is the Return of the Jordan Retro 5 "Laney". The upper is done in a smooth and buttery tumbled leather keeping it OG with the round laces and a bright Varsity Royal and Maize color highlights the shoe well. Theses will be on the top of many sneakerheads to cop list. Take a look at the HD Detailed pics and let us know if this is a cop for you. We have shown you images of the Limited Jordan 3Lab5 aka Elephant print Retro 5's. This special combination by Jordan Print is supposed to be a themed mix up in the Lab that some how combines both classic Shoes. The 3Lab5 will come in a Special box that depicts Genetic DNA printing that gives off a multi colored effect. Also comes with a special Imprinted paper and a Special card. Take a look at these detailed images of the special packaging the 3Lab5 will be coming in. These are set to Drop September 21st. Jordan Brand lately has been re-releasing some pretty rare heat started last year with the return of the Jordan IV "Thunder" then continued this year with the return of the DB 3. But a super rare 250 pair limited release was brought back by Jordan Brand recently. The Jordan Retro 1 China XQ that dropped in 2007 has made a return, but there are changes. JB added the NIKE AIR on the tongue and Use the higher cut model. Also adding more premium leather to the shoe. But once again it was only released in China and as a Limited release. Here as a few more pics of the Jordan Retro 1 XQ. We might not ever own them but we can enjoy the beauty. We first broke news of New of the Red October "Legends" Retro 3's weeks ago and shortly after we saw Justin Timberlake himself post a picture of them. Now we have a look at the Whole Red October Pack. This pack is A QS release is will drop in late October. The materials used suggest a high price tag and may be limited to Certain JB accounts. Here is a look at all 3 pairs from that pack. Stay tuned for more info on these pairs soon. Being is the 23rd Anniversary of the Retro 5's we expected t see some crazy 5's coming out. But no one expected JB to pay homage to maybe one of the best TV series of all time "The Fresh Prince of Bel Air" but they did and will be releasing a special Jordan Retro 5 dubbed in the same colors as the TV shoes Logo. Here we finally have detailed images of the Bel Air Retro 5 and from the looks of it Quality seems to be on point. No information is on hand yet on how limited or price but as soon as we get that info in we will share it with you. Mean time enjoy these beautiful images. The Fear pack that will be coming out over the next 2 months has been getting more of a buzz lately since JB athletes and Hip hop/Movie stars started to receive their pairs. But now we have detailed images of The Retro 5's from the pack. We see a ballistic type of material same used on the Army Orange 5s back in 2006. 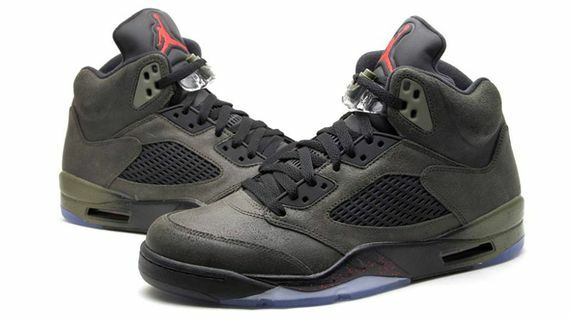 We see a use of Black and Red to highlight the 5's and a Color changing mid sole as we seen with the Fear 4s. Take a look at these detailed Pics courtesy of Flight Club. Retail will be $175.